Financial Modeling Add-ins for Excel (Five Keys To Business Success) consist of five powerful and important financial modeling solutions to realize efficiencies for business. 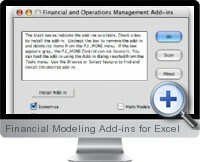 The Financial Modeling Add-ins cover advanced calculations for for forecasting, investment economics, portfolio optimization, business resource optimization and material requirements planning. Forecasting - Calculates moving averages, exponential smoothing moving averaging, linear regression and seasonal trend analysis. Investment Economics - Calculates net present values and internal rate of return after tax for any capital investment projects. Selects projects that meet users objectives when aggregated. Portfolio Optimization - Optimizes any investment portfolio to meet asset management objectives. Both business investments and security investments are catered for. Processes - Creates computer models to mirror business flows. Calculates the optimized scheduling of materials and resources which maximize profits. Process Flow can be utilized with line managers on each business step for scheduling the highest optimization of scarce resources. Materials Requirement Planning - Creates dynamic materials requirement planning (MRP) spreadsheets which optimize the least cost solution for manufacturing requirements. Analysis includes material purchasing, minimum inventory level definition and least cost production scheduling. Business Statistics for Excel - Instant calculation of Averages, Moving Averages, Mean, Median, Mode, Range, Frequency, Seasonality Trends, Correlation, Variance, Regression formula, Significance (T-Test), Sigma and Six Sigma values, Least Squares and Best Fit Forecasting. Suppression of unwanted zeros in data ranges, set upper and lower boundaries for calculations.